I haven't been posting anything here since forever. So as a new resolution, I decided to flood this blog slowly with my (not too) awesome drawings. Cable as I remember him. Nathan Christopher Charles Summers was born to Scott and Madelyne Pryor-Summers, as a weapon for Mr. Sinister to use against Apocalypse, and has been has been fighting in wars most of his life. A powerful mutant telepath and telekinetic, Nathan was so powerful that his powers manifested at a young age. After his mother died trying to sacrifice him, Nathan was infected by Apocalypse with the Techno-Organic Virus, that was set to kill him, until his father sent him into the future for treatment. 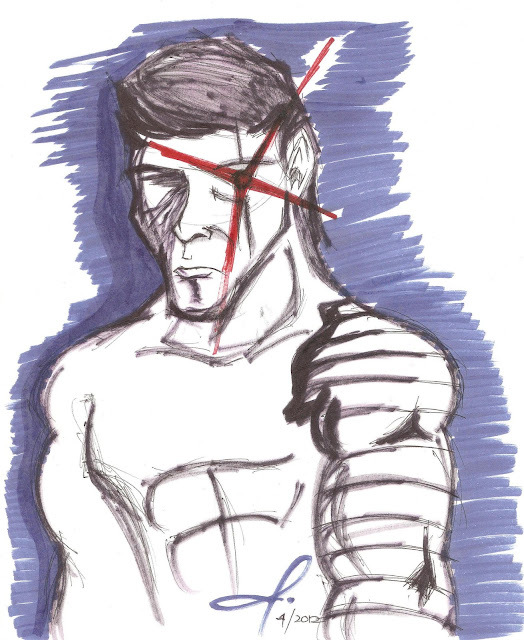 After being raised as the Askani'son, the one destined to kill Apocalypse, in the Clan Askani religion, Nathan became a hardened warrior and brilliant tactician. After founding the Clan Chosen and loosing the war, Nathan began to travel through time. Nathan eventually returned some fifteen years older than his father, calling himself Cable. With powerful powers often on the fritz, Cable sought to better the future of mankind, for he had seen the result of not doing so first-hand. After years of trying to eliminate threats, Cable eventually began a pacifist mentality and created the island Providence. After the birth of the messiah child, Cable faked his death and rescued her, taking her deep into the future, from the rogue X-Man,Bishop. After returning with an eighteen year old Hope Summers and died bringing X-Force back from stopping a scheme of Bastion.